By the 19th century, stained glass was being used almost exclusively to embellish church interiors. The Arts & Crafts firm Morris, Marshall, Faulkner & Co. (founded in 1861), was instrumental in reintroducing the medium to the home. 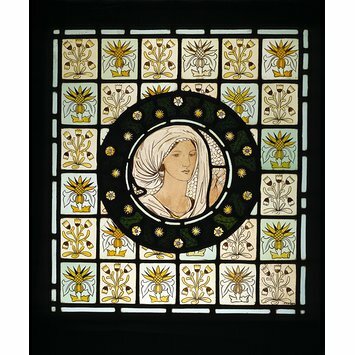 This panel was designed by Edward Burne-Jones (1833-1898), the most prolific and influential of the stained-glass designers working with William Morris during this period. This panel is one of four purchased from an exhibition of contemporary stained glass held at the South Kensington Museum in 1864. This roundel is one of a series of designs which depicts the 14th-century poet Geoffrey Chaucer (died 1400) and six characters from his poem 'Goode Wimmen' (Good Women). The heroine represented here - Penelope - whilst not featured in Chaucer's own tale, was famous as the model of domestic virtue in Homeric legend. 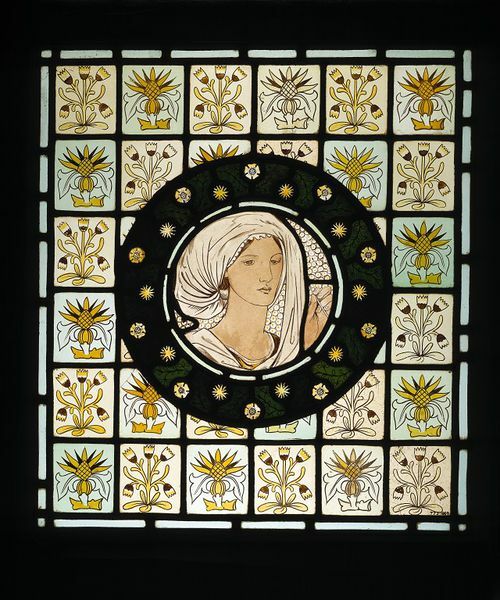 Burne-Jones adapted the design for this roundel from the head of Phyllis who appeared in another of the artist's 'Goode Wimmen' series. Adapting an existing design for several different commissions seems to have been common practice among those working for Morris & Co. Indeed, this same series had previously been used by Burne-Jones to decorate a set of tiles, an embroidered frieze, as well as forming the basis for at least three different stained-glass compositions. Panel. Medallion head of Penelope surrounded by diaper of flowers.